Hamburg (English: /ˈhæmbɜːrɡ/; German: [ˈhambʊɐ̯k] ( listen); officially the Free and Hanseatic City of Hamburg; German: Freie und Hansestadt Hamburg; Low German/Low Saxon: Friee un Hansestadt Hamborg) is the second-largest city in Germany with a population of over 1.8 million. 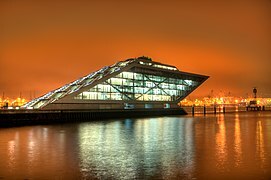 Hamburg is at a sheltered natural harbour on the southern fanning-out of the Jutland Peninsula, between Continental Europe to the south and Scandinavia to the north, with the North Sea to the west and the Baltic Sea to the northeast. It is on the River Elbe at its confluence with the Alster and Bille. The city centre is around the Binnenalster ("Inner Alster") and Außenalster ("Outer Alster"), both formed by damming the River Alster to create lakes. 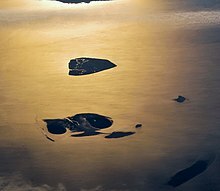 The islands of Neuwerk, Scharhörn, and Nigehörn, 100 kilometres (60 mi) away in the Hamburg Wadden Sea National Park, are also part of the city of Hamburg. The neighborhoods of Neuenfelde, Cranz, Francop and Finkenwerder are part of the Altes Land (old land) region, the largest contiguous fruit-producing region in Central Europe. Neugraben-Fischbek has Hamburg's highest elevation, the Hasselbrack at 116.2 metres (381 ft) AMSL. Hamburg borders the states of Schleswig-Holstein and Lower Saxony. 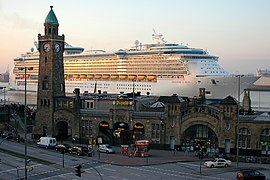 Hamburg has an oceanic climate (Köppen: Cfb), influenced by its proximity to the coast and marine air masses that originate over the Atlantic Ocean. The location north of Germany provides extremes greater than typically marine climates, but definitely in the category due to the mastery of the western standards. Nearby wetlands also enjoy a maritime temperate climate. The amount of snowfall has differed a lot during the past decades: while in the late 1970s and early 1980s, at times heavy snowfall occurred, the winters of recent years have been less cold, with snowfall only on a few days per year. At least 42,900 people are thought to have perished in the Neuengamme concentration camp (about 25 km (16 mi) outside the city in the marshlands), mostly from epidemics and in the bombing of Kriegsmarine evacuation vessels by the RAF at the end of the war. The Inner German border – only 50 kilometres (30 mi) east of Hamburg – separated the city from most of its hinterland and reduced Hamburg's global trade. Since German reunification in 1990, and the accession of several Central European and Baltic states into the European Union in 2004, the Port of Hamburg has restarted ambitions for regaining its position as the region's largest deep-sea port for container shipping and its major commercial and trading centre. On 31 December 2016, there were 1,860,759 people registered as living in Hamburg in an area of 755.3 km2 (291.6 sq mi). The population density was 2,464/km2 (6,380/sq mi). The metropolitan area of the Hamburg region (Hamburg Metropolitan Region) is home to 5,107,429 living on 196/km2 (510/sq mi). There were 915,319 women and 945,440 men in Hamburg. For every 1,000 females, there were 1,033 males. In 2015, there were 19,768 births in Hamburg (of which 38.3% were to unmarried women); 6422 marriages and 3190 divorces, and 17,565 deaths. In the city, the population was spread out with 16.1% under the age of 18, and 18.3% were 65 years of age or older. 356 People in Hamburg were over the age of 100. According to the Statistical Office for Hamburg and Schleswig Holstein, the number of people with a migrant background is at 34% (631,246). Immigrants come from 180 different countries. 5,891 people have acquired German cititzenship in 2016. In 2016, there were 1,021,666 households, of which 17.8% had children under the age of 18; 54.4% of all households were made up of singles. 25.6% of all households were single parent households. The average household size was 1.8. Like elsewhere in Germany, Standard German is spoken in Hamburg, but as typical for northern Germany, the original language of Hamburg is Low German, usually referred to as Hamborger Platt (German Hamburger Platt) or Hamborgsch. Since large-scale standardization of the German language beginning in earnest in the 18th century, various Low German-colored dialects have developed (contact-varieties of German on Low Saxon substrates). Originally, there was a range of such Missingsch varieties, the best-known being the low-prestige ones of the working classes and the somewhat more bourgeois Hanseatendeutsch (Hanseatic German), although the term is used in appreciation. All of these are now moribund due to the influences of Standard German used by education and media. However, the former importance of Low German is indicated by several songs, such as the famous sea shanty Hamborger Veermaster, written in the 19th century when Low German was used more frequently. Many toponyms and street names reflect Low Saxon vocabulary, partially even in Low Saxon spelling, which is not standardised, and to some part in forms adapted to Standard German. Less than half of the residents of Hamburg are members of a religion. In late 2015, 27.0% of the population belonged to the North Elbian Evangelical Lutheran Church, the largest religious body, and 10.7% to the Roman Catholic Church. An additional 55% stated they had no religion. According to the publication "Muslimisches Leben in Deutschland" (Muslim life in Germany) estimated 141,900 Muslim migrants (counting in nearly 50 countries of origin) lived in Hamburg in 2008. About three years later (May 2011) calculations based on census data for 21 countries of origin resulted in the number of about 143,200 Muslim migrants in Hamburg, making up 8.4% percent of the population. 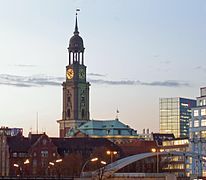 Hamburg is seat of one of the three bishops of the Evangelical Lutheran Church in Northern Germany and seat of the Roman Catholic Archdiocese of Hamburg. There are several mosques, including the Ahmadiyya run Fazle Omar Mosque, which is the oldest in the city, the Islamic Centre Hamburg, and a Jewish community. 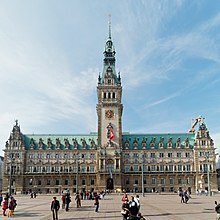 Since 1897, the seat of the government has been the Hamburg Rathaus (Hamburg City Hall), with the office of the mayor, the meeting room for the Senate and the floor for the Hamburg Parliament. From 2001 until 2010, the mayor of Hamburg was Ole von Beust, who governed in Germany's first statewide "black-green" coalition, consisting of the conservative CDU and the alternative GAL, which are Hamburg's regional wing of the Alliance 90/The Greens party. Von Beust was briefly succeeded by Christoph Ahlhaus in 2010, but the coalition broke apart on November, 28. 2010. On 7 March 2011 Olaf Scholz (SPD) became mayor. After the 2015 election the SPD and the Alliance 90/The Greens formed a coalition. Hamburg is made up of seven boroughs (German: Bezirke) and subdivided into 104 quarters (German: Stadtteile). There are 181 localities (German: Ortsteile). The urban organization is regulated by the Constitution of Hamburg and several laws. Most of the quarters were former independent cities, towns or villages annexed into Hamburg proper. The last large annexation was done through the Greater Hamburg Act of 1937, when the cities Altona, Harburg and Wandsbek were merged into the state of Hamburg. The Act of the Constitution and Administration of Hanseatic city of Hamburg established Hamburg as a state and a municipality. Some of the boroughs and quarters have been rearranged several times. Each borough is governed by a Borough Council (German: Bezirksversammlung) and administered by a Municipal Administrator (German: Bezirksamtsleiter). The boroughs are not independent municipalities: their power is limited and subordinate to the Senate of Hamburg. The borough administrator is elected by the Borough Council and thereafter requires confirmation and appointment by Hamburg's Senate. The quarters have no governing bodies of their own. In 2008, the boroughs were Hamburg-Mitte, Altona, Eimsbüttel, Hamburg-Nord, Wandsbek, Bergedorf and Harburg. Hamburg-Mitte ("Hamburg Centre") covers mostly the urban centre of the city and consists of the quarters Billbrook, Billstedt, Borgfelde, Finkenwerder, HafenCity, Hamm, Hammerbrook, Horn, Kleiner Grasbrook, Neuwerk, Rothenburgsort, St. Georg, St. Pauli, Steinwerder, Veddel, Waltershof and Wilhelmsburg. The quarters Hamburg-Altstadt ("old town") and Neustadt ("new town") are the historical origin of Hamburg. Altona is the westernmost urban borough, on the right bank of the Elbe river. 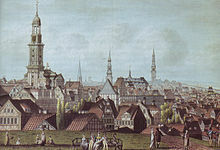 From 1640 to 1864, Altona was under the administration of the Danish monarchy. Altona was an independent city until 1937. 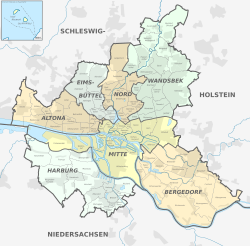 Politically, the following quarters are part of Altona: Altona-Altstadt, Altona-Nord, Bahrenfeld, Ottensen, Othmarschen, Groß Flottbek, Osdorf, Lurup, Nienstedten, Blankenese, Iserbrook, Sülldorf, Rissen, Sternschanze. 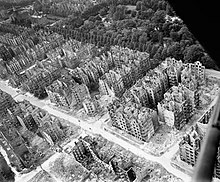 Hamburg-Nord contains the quarters Alsterdorf, Barmbek-Nord, Barmbek-Süd, Dulsberg, Eppendorf, Fuhlsbüttel, Groß Borstel, Hoheluft-Ost, Hohenfelde, Langenhorn, Ohlsdorf with Ohlsdorf cemetery, Uhlenhorst and Winterhude. Hamburg has architecturally significant buildings in a wide range of styles and no skyscrapers (see List of tallest buildings in Hamburg). Churches are important landmarks, such as St Nicholas', which for a short time in the 19th century was the world's tallest building. The skyline features the tall spires of the most important churches (Hauptkirchen) St Michael's (nicknamed "Michel"), St Peter's, St James's (St. Jacobi) and St. Catherine's covered with copper plates, and the Heinrich-Hertz-Turm, the radio and television tower (no longer publicly accessible). The Chilehaus with a typical brick expressionist façade. The many streams, rivers and canals are crossed by some 2,500 bridges, more than London, Amsterdam and Venice put together. Hamburg has more bridges inside its city limits than any other city in the world. The Köhlbrandbrücke, Freihafen Elbbrücken, and Lombardsbrücke and Kennedybrücke dividing Binnenalster from Aussenalster are important roadways. The town hall is a richly decorated Neo-Renaissance building finished in 1897. The tower is 112 metres (367 ft) high. Its façade, 111 m (364 ft) long, depicts the emperors of the Holy Roman Empire, since Hamburg was, as a Free Imperial City, only under the sovereignty of the emperor. 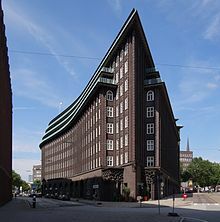 The Chilehaus, a brick expressionist office building built in 1922 and designed by architect Fritz Höger, is shaped like an ocean liner. Europe's largest urban development since 2008, the HafenCity, will house about 10,000 inhabitants and 15,000 workers. The plan includes designs by Rem Koolhaas and Renzo Piano. The Elbphilharmonie (Elbe Philharmonic Hall), opened in January 2017, houses concerts in a sail-shaped building on top of an old warehouse, designed by architects Herzog & de Meuron. The many parks are distributed over the whole city, which makes Hamburg a very verdant city. The biggest parks are the Stadtpark, the Ohlsdorf Cemetery and Planten un Blomen. The Stadtpark, Hamburg's "Central Park", has a great lawn and a huge water tower, which houses one of Europe's biggest planetaria. The park and its buildings were designed by Fritz Schumacher in the 1910s. 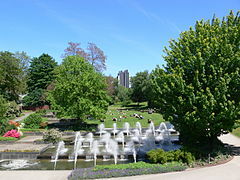 The lavish and spacious Planten un Blomen park (Low German dialect for "plants and flowers") located in the centre of Hamburg is the green heart of the city. Within the park are various thematic gardens, the biggest Japanese garden in Germany, and the Alter Botanischer Garten Hamburg, which is a historic botanical garden that now consists primarily of greenhouses. The Botanischer Garten Hamburg is a modern botanical garden maintained by the University of Hamburg. Besides these, there are many more parks of various sizes. In 2014 Hamburg celebrated a birthday of park culture, where many parks were reconstructed and cleaned up. Moreover, every year there are the famous water-light-concerts in the Planten un Blomen park from May to early October. Hamburg has more than 40 theatres, 60 museums and 100 music venues and clubs. In 2005, more than 18 million people visited concerts, exhibitions, theatres, cinemas, museums, and cultural events. More than 8,552 taxable companies (average size 3.16 employees) were engaged in the culture sector, which includes music, performing arts and literature. There are five companies in the creative sector per thousand residents (as compared to three in Berlin and 37 in London). Hamburg has entered the European Green Capital Award scheme, and was awarded the title of European Green Capital for 2011. The state-owned Deutsches Schauspielhaus, the Thalia Theatre, Ohnsorg Theatre, "Schmidts Tivoli" and the Kampnagel are well-known theatres. 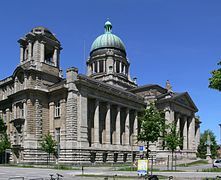 Hamburg has several large museums and galleries showing classical and contemporary art, for example the Kunsthalle Hamburg with its contemporary art gallery (Galerie der Gegenwart), the Museum for Art and Industry (Museum für Kunst und Gewerbe) and the Deichtorhallen/House of Photography. The Internationales Maritimes Museum Hamburg opened in the HafenCity quarter in 2008. There are various specialised museums in Hamburg, such as the Archaeological Museum Hamburg (Archäologisches Museum Hamburg) in Hamburg-Harburg, the Hamburg Museum of Work (Museum der Arbeit), and several museums of local history, for example the Kiekeberg Open Air Museum (Freilichtmuseum am Kiekeberg). Two museum ships near Landungsbrücken bear witness to the freight ship (Cap San Diego) and cargo sailing ship era (Rickmer Rickmers). The world's largest model railway museum Miniatur Wunderland with 15.4 km (9.57 mi) total railway length is also situated near Landungsbrücken in a former warehouse. BallinStadt (Emigration City) is dedicated to the millions of Europeans who emigrated to North and South America between 1850 and 1939. Visitors descending from those overseas emigrants may search for their ancestors at computer terminals. The iconic Elbphilharmonie in Hafen-City, seen from the Speicherstadt. Hamburg State Opera is a leading opera company. Its orchestra is the Philharmoniker Hamburg. 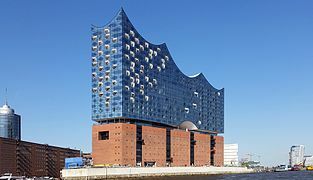 The city's other well-known orchestra is the NDR Elbphilharmonie Orchestra. The main concert venue is the new concert hall Elbphilharmonie. Before it was the Laeiszhalle, Musikhalle Hamburg. The Laeiszhalle also houses a third orchestra, the Hamburger Symphoniker. György Ligeti and Alfred Schnittke taught at the Hochschule für Musik und Theater Hamburg. Since the German premiere of Cats in 1986, there have always been musicals running, including The Phantom of the Opera, The Lion King, Dirty Dancing and Dance of the Vampires (musical). This density, the highest in Germany, is partly due to the major musical production company Stage Entertainment being based in the city. Hamburg is the birthplace of Johannes Brahms, who spent his formative early years in the city, and the birthplace and home of the famous waltz composer Oscar Fetrás, who wrote the well-known "Mondnacht auf der Alster" waltz. Prior to the group's initial recording and widespread fame, Hamburg provided residency and performing venues for the Beatles from 1960 to 1962. Hamburg has nurtured a number of pop musicians. Identical twins Bill Kaulitz and Tom Kaulitz from the rock band Tokio Hotel live and maintain a recording studio in Hamburg, where they recorded their second and third albums, Zimmer 483 and Humanoid. Singer Nena also lives in Hamburg. There are German hip hop acts, such as Fünf Sterne deluxe, Samy Deluxe, Beginner and Fettes Brot. There is a substantial alternative and punk scene, which gathers around the Rote Flora, a squatted former theatre located in the Sternschanze. Hamburg is famous for an original kind of German alternative music called Hamburger Schule ("Hamburg School"), a term used for bands like Tocotronic, Blumfeld, Tomte or Kante. 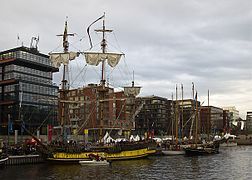 Hamburg is noted for several festivals and regular events. 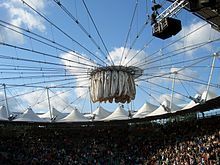 Some of them are street festivals, such as the gay pride Hamburg Pride festival or the Alster fair (German: Alstervergnügen), held at the Binnenalster. The Hamburger DOM is northern Germany's biggest funfair, held three times a year. Hafengeburtstag is a funfair to honour the birthday of the port of Hamburg with a party and a ship parade. The annual biker's service in Saint Michael's Church attracts tens of thousands of bikers. Christmas markets in December are held at the Hamburg Rathaus square, among other places. The long night of museums (German: Lange Nacht der Museen) offers one entrance fee for about 40 museums until midnight. The sixth Festival of Cultures was held in September 2008, celebrating multi-cultural life. The Filmfest Hamburg — a film festival originating from the 1950s Film Days (German: Film Tage) — presents a wide range of films. The Hamburg Messe and Congress offers a venue for trade shows, such hanseboot, an international boat show, or Du und deine Welt, a large consumer products show. 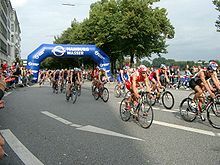 Regular sports events—some open to pro and amateur participants—are the cycling competition EuroEyes Cyclassics, the Hamburg Marathon, the biggest marathon in Germany after Berlin, the tennis tournament Hamburg Masters and equestrian events like the Deutsches Derby. 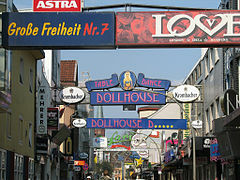 Since 2007, Hamburg has the Dockville music and art festival. It takes place every year in summer in Wilhelmsburg. Original Hamburg dishes are Birnen, Bohnen und Speck (green beans cooked with pears and bacon), Aalsuppe (Hamburgisch Oolsupp) is often mistaken to be German for "eel soup" (Aal/Ool translated ‘eel’), but the name probably comes from the Low Saxon allns [aˑlns], meaning "all", "everything and the kitchen sink", not necessarily eel. Today eel is often included to meet the expectations of unsuspecting diners. There is Bratkartoffeln (pan-fried potato slices), Finkenwerder Scholle (Low Saxon Finkwarder Scholl, pan-fried plaice), Pannfisch (pan-fried fish with mustard sauce), Rote Grütze (Low Saxon Rode Grütt, related to Danish rødgrød, a type of summer pudding made mostly from berries and usually served with cream, like Danish rødgrød med fløde) and Labskaus (a mixture of corned beef, mashed potatoes and beetroot, a cousin of the Norwegian lapskaus and Liverpool's lobscouse, all offshoots off an old-time one-pot meal that used to be the main component of the common sailor's humdrum diet on the high seas). There is the curious regional dessert pastry called Franzbrötchen. Looking rather like a flattened croissant, it is similar in preparation but includes a cinnamon and sugar filling, often with raisins or brown sugar streusel. The name may also reflect to the roll's croissant-like appearance – franz appears to be a shortening of französisch, meaning "French", which would make a Franzbrötchen a "French roll". Ordinary bread rolls tend to be oval-shaped and of the French bread variety. The local name is Schrippe (scored lengthways) for the oval kind and, for the round kind, Rundstück ("round piece" rather than mainstream German Brötchen, diminutive form of Brot "bread"), a relative of Denmark's rundstykke. In fact, while by no means identical, the cuisines of Hamburg and Denmark, especially of Copenhagen, have a lot in common. This also includes a predilection for open-faced sandwiches of all sorts, especially topped with cold-smoked or pickled fish. The American hamburger may have developed from Hamburg's Frikadeller: a pan-fried patty (usually larger and thicker than its American counterpart) made from a mixture of ground beef, soaked stale bread, egg, chopped onion, salt and pepper, usually served with potatoes and vegetables like any other piece of meat, not usually on a bun. The Oxford Dictionary defined a Hamburger steak in 1802: a sometimes-smoked and -salted piece of meat, that, according to some sources, came from Hamburg to America. The name and food, "hamburger", has entered all English-speaking countries, and derivative words in non-English speaking countries. There are restaurants which offer most of these dishes, especially in the HafenCity. Hamburg has long been a centre of alternative music and counter-culture movements. The boroughs of St. Pauli, Sternschanze and Altona are known for being home to many radical left-wing and anarchist groups, culminating every year during the traditional May Day demonstrations. The Rote Flora is a former theatre, which was squatted in 1989 in the wake of redevelopment plans for that area. Since then, the Rote Flora has become one of the most well-known strongholds against gentrification and a place for radical culture throughout Germany and Europe. Especially during the 33rd G8 summit in nearby Heiligendamm, the Rote Flora served as an important venue for organising the counter-protests that were taking place back then. During the 2017 G20 summit, which took place in Hamburg from 7–8 July that year, protestors clashed violently with the police in the Sternschanze area and particularly around the Rote Flora. On 7 July, several cars were set on fire and street barricades were erected to prevent the police from entering the area. In response to that, the police made heavy use of water cannons and tear gas in order to scatter the protestors. However, this was met with strong resistance by protestors, resulting in a total of 160 injured police and 75 arrested participants in the protests. After the summit, however, the Rote Flora issued a statement, in which it condemns the arbitrary acts of violence that were committed by some of the protestors whilst generally defending the right to use violence as a means of self-defence against police oppression. In particular, the spokesperson of the Rote Flora said that the autonomous cultural centre had a traditionally good relationship with its neighbours and local residents, since they were united in their fight against gentrification in that neighbourhood. There are several English-speaking communities, such as the Caledonian Society of Hamburg, The British Club Hamburg, British and Commonwealth Luncheon Club, Anglo-German Club e.V., Professional Women's Forum, The British Decorative and Fine Arts Society, The English Speaking Union of the Commonwealth, The Scottish Country Dancers of Hamburg, The Hamburg Players e.V. English Language Theatre Group, The Hamburg Exiles Rugby Club, several cricket clubs, and The Morris Minor Register of Hamburg. Furthermore, the Anglo-Hanseatic Lodge No. 850 within the Grand Lodge of British Freemasons of Germany under the United Grand Lodges of Germany works in Hamburg, and has a diverse expat membership. There is also a 400-year-old Anglican church community worshiping at St Thomas Becket Church. American and international English-speaking organisations include The American Club of Hamburg e.V., the American Women's Club of Hamburg, the English Speaking Union, the German-American Women's Club, and The International Women's Club of Hamburg e.V. The American Chamber of Commerce handles matters related to business affairs. The International School of Hamburg serves school children. William Wordsworth, Dorothy Wordsworth and Samuel Taylor Coleridge spent the last two weeks of September 1798 at Hamburg. Dorothy wrote a detailed journal of their stay, labelled "The Hamburg Journal (1798) by noted Wordsworth scholar Edward de Selincourt. 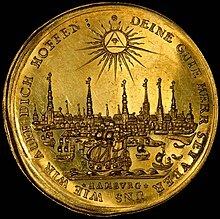 A Hamburg saying, referring to its anglophile nature, is: "Wenn es in London anfängt zu regnen, spannen die Hamburger den Schirm auf." ... "When it starts raining in London, people in Hamburg open their umbrellas.". A memorial for successful English engineer William Lindley, who reorganized, beginning in 1842, the drinking water and sewage system and thus helped to fight against cholera, is near Baumwall train station in Vorsetzen street. In 2009, more than 2,500 "stumbling blocks" (Stolpersteine) were laid, engraved with the names of deported and murdered citizens. Inserted into the pavement in front of their former houses, the blocks draw attention to the victims of Nazi persecution. The 2016 gross domestic product (GDP) totaled €110.7 billion. The city has a relatively high employment rate, at 88 percent of the working-age population, employed in over 160,000 businesses. The average income in 2016 of employees was €49,332. The unemployment rate stood at 6.1% in October 2018 and was higher than the German average. Hamburg has for centuries been a commercial centre of Northern Europe, and is the most important banking city of Northern Germany. The city is the seat of Germany's oldest bank, the Berenberg Bank, M.M.Warburg & CO and HSH Nordbank. The Hamburg Stock Exchange is the oldest of its kind in Germany. The most significant economic unit is the Port of Hamburg, which ranks third to Rotterdam and Antwerpen in Europe and 17th-largest worldwide with transshipments of 8.9 million twenty-foot equivalent units (TEU) of cargo and 138.2 million tons of goods in 2016. International trade is also the reason for the large number of consulates in the city. Although situated 68 miles (110 km) up the Elbe, it is considered a sea port due to its ability to handle large ocean-going vessels. Heavy industry of Hamburg includes the making of steel, aluminium, copper and various large shipyards such as Blohm + Voss. Hamburg, along with Seattle and Toulouse, is an important location of the civil aerospace industry. 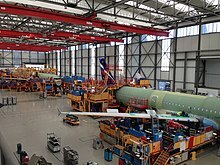 Airbus, which has an assembly plant in Finkenwerder, employs over 13,000 people. The HafenCity is Europe's largest urban development project and is located in the Hamburg-Mitte district. It consists of the area of the Great Grasbrook, the northern part of the former Elbe island Grasbrook, and the warehouse district on the former Elbe island Kehrwieder and Wandrahm. 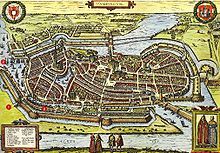 It is bordered to the north, separated by the customs channel to Hamburg's city center, west and south by the Elbe and to the east, bounded by the upper harbor, Rothenburgsort. The district is full of rivers and streams and is surrounded by channels, and has a total area of about 2.2 square-kilometers. HafenCity has 155 hectares in the area formerly belonging to the free port north of the Great Grasbrook. Residential units for up to 12,000 people are planned to be built on the site by around the mid-2020s, and jobs for up to 40,000 people, mainly in the office sector, should be created. It is the largest ongoing urban development project in Hamburg. Construction work started in 2003, and in 2009 the first part of the urban development project was finished with the completion of the Dalmannkai / Sandtorkai neighborhood – which is the first stage of the HafenCity project. According to the person responsible for the development and commercialization of HafenCity, HafenCity Hamburg GmbH, half of the master plan underlying structural construction is already completed, whereas the other half is either under construction or is in the construction preparation stages. In 2017, more than 6,783,000 visitors with 13,822,000 overnight stays visited the city. The tourism sector employs more than 175,000 people full-time and brings in revenue of almost €9 billion, making the tourism industry a major economic force in the Hamburg Metropolitan Region. Hamburg has one of the fastest-growing tourism industries in Germany. From 2001 to 2007, the overnight stays in the city increased by 55.2% (Berlin +52.7%, Mecklenburg-Vorpommern +33%). The area of Reeperbahn in the quarter St. Pauli is Europe's largest red light district and home of strip clubs, brothels, bars and nightclubs. The singer and actor Hans Albers is strongly associated with St. Pauli, and wrote the neighbourhood's unofficial anthem, "Auf der Reeperbahn Nachts um Halb Eins" ("On the Reeperbahn at Half Past Midnight") in the 1940s. The Beatles had stints on the Reeperbahn early in their careers. 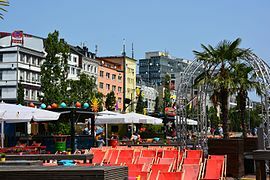 Others prefer the laid-back neighbourhood Schanze with its street cafés, or a barbecue on one of the beaches along the river Elbe. Hamburg's famous zoo, the Tierpark Hagenbeck, was founded in 1907 by Carl Hagenbeck as the first zoo with moated, barless enclosures. In 2016, the average visitor spent two nights in Hamburg. The majority of visitors come from Germany. Most foreigners are European, especially from Denmark (395,681 overnight stays), the United Kingdom (301,000 overnight stays), Switzerland (340,156 overnight stays), Austria (about 252,397 overnight stays) and the Netherlands (about 182,610 overnight stays). The largest group from outside Europe comes from the United States (206,614 overnight stays). The Queen Mary 2 has docked regularly since 2004, and there were six departures planned from 2010 onwards. Media businesses employ over 70,000 people. The Norddeutscher Rundfunk which includes the television station NDR Fernsehen is based in Hamburg, including the very popular news program Tagesschau, as are the commercial television station Hamburg 1, the Christian television station Bibel TV and the civil media outlet Tide TV. There are regional radio stations such as Radio Hamburg. Some of Germany's largest publishing companies, Axel Springer AG, Gruner + Jahr, Bauer Media Group are located in the city. Many national newspapers and magazines such as Der Spiegel and Die Zeit are produced in Hamburg, as well as some special-interest newspapers such as Financial Times Deutschland. Hamburger Abendblatt and Hamburger Morgenpost are daily regional newspapers with a large circulation. There are music publishers, such as Warner Bros. Records Germany, and ICT firms such as Adobe Systems and Google Germany. Hamburg was one of the locations for the James Bond series film Tomorrow Never Dies. The Reeperbahn has been the location for many scenes, including the 1994 Beatles film Backbeat. The film A Most Wanted Man was set in and filmed in Hamburg. Hamburg was also shown in An American Tail where Fievel Mousekewitz and his family immigrate to America in the hopes to escape cats. Hamburg has 54 hospitals. The University Medical Center Hamburg-Eppendorf, with about 1,736 beds, houses a large medical school. There are also smaller private hospitals. On 1 January 2011 there were about 12,507 hospital beds. The city had 5,663 physicians in private practice and 456 pharmacies in 2010. Hamburg is a major transportation hub, connected to four Autobahnen (motorways) and the most important railway junction on the route to Scandinavia. Bridges and tunnels connect the northern and southern parts of the city, such as the old Elbe Tunnel (Alter Elbtunnel) or St. Pauli Elbtunnel (official name) which opened in 1911, now is major tourist sight, and the Elbe Tunnel (Elbtunnel) the crossing of a motorway. Public transport by rail, bus and ship is organised by the Hamburger Verkehrsverbund ("Hamburg transit authority") (HVV). Tickets sold by one company are valid on all other HVV companies' services. The HVV was the first organisation of this kind worldwide. 33 mass transit rail lines across the city are the backbone of public transport. The S-Bahn (heavy railway system) comprises six lines and the U-Bahn four lines – U-Bahn is short for Untergrundbahn (underground railway). Approximately 41 km (25 mi) of 101 km (63 mi) of the U-Bahn is underground; most is on embankments or viaduct or at ground level. Older residents still speak of the system as Hochbahn (elevated railway), also because the operating company of the subway is the Hamburger Hochbahn. The AKN railway connects satellite towns in Schleswig-Holstein to the city. On some routes regional trains of Germany's major railway company Deutsche Bahn AG and the regional metronom trains may be used with an HVV ticket. Except at the four bigger stations of the city, Hauptbahnhof, Dammtor, Altona and Harburg regional trains do not stop inside the city. The tram system was opened in 1866 and shut down in 1978. There are eight ferry lines along the River Elbe, operated by HADAG, that fall under the aegis of the HVV. While mainly used by citizens and dock workers, they can also be used for sightseeing tours. The international airport at Hamburg Fuhlsbüttel, official name Hamburg Airport „Helmut Schmidt“ (IATA: HAM, ICAO: EDDH) is the fifth biggest and oldest airport in Germany, having been established in 1912 and located about 5 miles (8 kilometres) from the city centre. About 60 airlines provide service to 125 destination airports, including some long distance destinations like Newark, New Jersey on United Airlines, Dubai on Emirates, and Tehran on Iran Air; Lufthansa is the hub carrier, with the most flights and operates one of its biggest maintenance facilities at the Hamburg airport (Lufthansa Technik). The second airport is located in Hamburg-Finkenwerder, official name Hamburg Finkenwerder Airport (IATA: XFW, ICAO: EDHI). It is about 10 km (6 mi) from the city centre and is a nonpublic airport for the Airbus plant. It is the second biggest Airbus plant, after Toulouse, and the third biggest aviation manufacturing plant after Seattle and Toulouse; the plant houses the final assembly lines for A318, A319, A320, A321 and A380 aircraft. The average amount of time people spend commuting with public transit in Hamburg, for example to and from work, on a weekday is 58 min. 16% of public transit riders, ride for more than two hours every day. The average amount of time people wait at a stop or station for public transit is 11 min, while 11% of riders wait for over 20 minutes on average every day. The average distance people usually ride in a single trip with public transit is 8.9 km, while 21% travel for over 12 km in a single direction. Electricity for Hamburg and Northern Germany is largely provided by Vattenfall Europe, formerly the state-owned Hamburgische Electricitäts-Werke. Vattenfall Europe used to operate the Brunsbüttel Nuclear Power Plant and Krümmel Nuclear Power Plant, both taken out of service as part of the nuclear power phase-out. In addition, E.ON operates the Brokdorf Nuclear Power Plant near Hamburg. There are also the coal-fired Wedel, Tiefstack and Moorburg CHP Plant, and the fuel-cell power plant in the HafenCity quarter. VERA Klärschlammverbrennung uses the biosolids of the Hamburg wastewater treatment plant; the Pumpspeicherwerk Geesthacht is a pump storage power plant and a solid waste combustion power station is Müllverwertung Borsigstraße. Hamburger SV is a football team playing in the 2. Bundesliga (as of 2018). The HSV was the oldest team of the Bundesliga, playing in the league since its beginning in 1963 until a change of results saw them relegated from the Bundesliga in 2018. HSV is a six-time German champion, a three-time German cup winner and triumphed in the European Cup in 1983, and has played in the group stages of the Champions League twice: in 2000–01 and in 2006–07. They play at the Volksparkstadion (average attendance in the 12–13 season was 52,916). In addition, FC St. Pauli was a second division football club that came in second place in the 2009–10 season and qualified to play alongside Hamburger SV in the first division for the first time since the 2001–02 season. St. Pauli's home games take place at the Millerntor-Stadion. The Hamburg Freezers represented Hamburg until 2016 in the DEL, the premier ice hockey league in Germany. HSV Handball represented Hamburg until 2016 in the German handball league. In 2007, HSV Handball won the European Cupwinners Cup. The Club won the league in the 2010–11 season and had an average attendance of 10.690 in the O2 World Hamburg the same year. The most recent success for the team was the EHF Champions League win in 2013. Since 2014, the club has suffered from economic problems and was almost not allowed the playing licence for the 2014–15 season. But due to economic support from the former club president/sponsor Andreas Rudolf the club was allowed the licence in the last minute. On 20 January 2016 however, their licence was removed due to violations following the continued economic struggles. In 2016–17, they were not allowed to play in the first or second league. The team lives on through their former second team (now their main team) in the third division (2016-2018) and in second division (since 2018). The BCJ Hamburg played in the Basketball Bundesliga from 1999 to 2001. Since then, teams from Hamburg have attempted to return to Germany's elite league. The recently founded Hamburg Towers have already established themselves as one of the main teams in Germany's second division ProA and aim to take on the heritage of the BCJ Hamburg. The Towers play their home games at the Inselparkhalle in Wilhelmsburg. Hamburg is the nation's field hockey capital and dominates the men's as well as the women's Bundesliga. 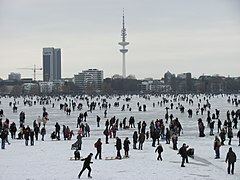 Hamburg hosts many top teams such as Uhlenhorster Hockey Club, Harvesterhuder Hockey Club and Club An Der Alster. Hamburg also hosts equestrian events at Reitstadion Klein Flottbek (Deutsches Derby in jumping and dressage) and Horner Rennbahn (Deutsches Derby flat racing). Besides Hamburg owns the famous harness racing track "Trabrennbahn Bahrenfeld". The Hamburg Marathon is the biggest marathon in Germany after Berlin's. In 2008 23,230 participants were registered. World Cup events in cycling, the UCI ProTour competition EuroEyes Cyclassics, and the triathlon ITU World Cup event Hamburg City Man are also held in here. Volksparkstadion was used as a site for the 2006 World Cup. In 2010 UEFA held the final of the UEFA Europa League in the arena. Hamburg made a bid for the 2024 Olympic Games, but 51.7 percent of those city residents participating in a referendum in November 2015 voted against continuing Hamburg's bid to host the games. Meanwhile, Hamburg's partner city Kiel voted in favour of hosting the event, with almost 66 percent of all participants supporting the bid. Opponents of the bid had argued that hosting the 33rd Olympic Games would cost the city too much in public funds. The school system is managed by the Ministry of Schools and Vocational Training (Behörde für Schule und Berufsbildung). The system had approximately 191,148 students in 221 primary schools and 188 secondary schools in 2016. There are 32 public libraries in Hamburg. Nineteen universities are located in Hamburg, with about 100,589 university students in total, including 9,000 resident students. Six universities are public, including the largest, the University of Hamburg (Universität Hamburg) with the University Medical Center Hamburg-Eppendorf, the University of Music and Theatre, the Hamburg University of Applied Sciences, the HafenCity University Hamburg and the Hamburg University of Technology. Seven universities are private, like the Bucerius Law School and the HSBA Hamburg School of Business Administration. 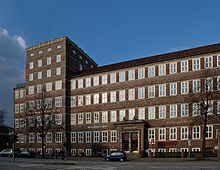 The city has also smaller private colleges and universities, including many religious and special-purpose institutions, such as the Helmut Schmidt University (formerly the University of the Federal Armed Forces Hamburg). Hamburg is home to one of the oldest international schools in Germany, the International School of Hamburg. Hamburg has nine twin towns and sister cities around the world. Dar es Salaam, Tanzania became its newest sister city in 2010. —  Siegfried Lenz, in Leute von Hamburg (People of Hamburg) ISBN 978-3-423-11538-4. ^ "State population". Portal of the Land Statistics Office Hamburg. Retrieved 15 November 2017. ^ "Bruttoinlandsprodukt – in jeweiligen Preisen – in Deutschland 1991 bis 2016 nach Bundesländern (WZ 2008) – VGR dL". www.vgrdl.de. ^ "Bruttoinlandsprodukt – in jeweiligen Preisen – in Deutschland 1991 bis 2017 nach Bundesländern (WZ 2008) – VGR dL". www.statistik-bw.de. ^ "2015 Quality of Living survey". Mercer.com. Retrieved 21 July 2015. ^ Media release on the website of Hamburg Marketing, retrieved on 19 March 2016. ^ "Hamburg, Germany Köppen Climate Classification (Weatherbase)". Weatherbase. Retrieved 7 February 2019. ^ Report on the snowfall disaster of 1978/1979 in northern Germany, retrieved on 20 July 2016. ^ Article on the winters in Germany, retrieved on 20 July 2016. ^ Comparison Archived 7 October 2016 at the Wayback Machine of the weather and snowfall in German winters (from 1950 on), retrieved on 20 July 2016. ^ a b "World Weather Information Service – Hamburg". Deutscher Wetterdienst. Retrieved 6 April 2012. ^ "Ausgabe der Klimadaten: Monatswerte". Retrieved 24 June 2014. ^ "Hamburg-Fuhlsbüttel (10147) - WMO Weather Station". NOAA. Retrieved 7 February 2019. ^ Schulz, Matthias (1 October 2010). "Mapping Ancient Germania: Berlin Researchers Crack the Ptolemy Code" – via Spiegel Online. ^ "Hammaburg – der große Irrtum" (in German). Hamburg Abendblatt. 12 December 2007. Retrieved 30 September 2008. ^ "World Port Ranking 2011" (PDF). ^ "Gedenkstätte Konzentrationslager Neuengamme". Kz-gedenkstaette-neuengamme.de. Retrieved 14 September 2013. ^ "Fußball-Underdog WM-Finale am Sonntag: So sind wir Kroaten". Retrieved 14 July 2018. ^ "Statistische Berichte: Ausländische Bevölkerung in Hamburg" (PDF). Retrieved 21 June 2018. ^ Several places are named ...brook (Billbrook, Brooktor, Grasbrook, Hammerbrook, Hellbrook, Iserbrook) rather than Standard German ...bruch (neutr. ; =brook riverscape), Bullenhusen rather than Bullenhausen, Lohbrügge rather than Lohbrücke, several localities starting with Nien... (Niendorf, Nienstedten) rather than Neuen..., or ending ...hude (Dockenhuden, Harvestehude, Winterhude) rather than ...hut[ung] (fem. ; =pasture), Uhlenhorst rather than Eulenhorst, several places and water bodies are named ...bek (Barmbek, Eilbek, Fischbek, Flottbek, Goldbek, Isebek, Kirchsteinbek, Langenbek, Osterbek, Pepermölenbek, Wandsbek) rather than ...bach, several places and water bodies are called ...fleet (Alsterfleet, Bleichenfleet, Moorfleet) rather than ...fließ (=brook, stream). 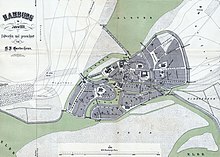 Further toponyms with no close Standard German correspondents appear, such as ...büttel (=inhabited place; Eimsbüttel, Fuhlsbüttel, Hummelsbüttel, Poppenbüttel, Wellingsbüttel) or Twiete (=alley wedged between buildings). Like in other parts of Northern Germany ...stedt (Bergstedt, Billstedt, Duvenstedt, Eidelstedt, Lokstedt, Mellingstedt, Nienstedten, Ohlstedt, Rahlstedt) prevails over ...stadt (=town, originally simply stead). ^ "Kartenseite: Muslime in den Landkreisen beim Zensus 2011" (PDF). Retrieved 30 April 2017. ^ "Deutschlands älteste Moschee wurde 50". 19 June 2007. Retrieved 8 June 2014. ^ Schwarz-Grün in Hamburg am Ende in Die Zeit – online, revisited on November, 28. 2010. ^ "Hamburg: Germany's Window to the World". EuropeUpClose.com. 18 April 2012. Retrieved 12 March 2013. ^ "''The English Theatre'' of Hamburg". Englishtheatre.de. Retrieved 14 September 2013. ^ "Museums in Hamburg". Retrieved 29 December 2009. ^ "Hamburg Pride" (in German). Retrieved 5 October 2008. ^ "Alstervergnügen Hamburg" (in German). Retrieved 5 October 2008. ^ "Wann ist DOM" (in German). Retrieved 5 October 2008. ^ "Hafengeburtstag Hamburg". Retrieved 5 October 2008. ^ "Zehntausende Biker und ein schwerer Unfall" (in German). Spiegel online. 13 July 2008. Retrieved 5 October 2008. ^ "Weihnachtsmärkte in Hamburg-Mitte 2008" (in German). Bezirk Hamburg-Mitte. Archived from the original on 18 September 2009. Retrieved 30 September 2008. ^ "Lange Nacht der Museen" (in German). Retrieved 5 October 2008. ^ "6. Festival der Kulturen Hamburg". Archived from the original on 13 June 2002. Retrieved 5 October 2008. ^ "Filmfest Hamburg". Retrieved 5 October 2008. ^ "Welcoming the world". Archived from the original on 1 December 2005. Retrieved 5 October 2008. ^ "Mandago, Timofeyeva impress at Hamburg Marathon". 27 April 2008. Archived from the original on 20 October 2012. Retrieved 5 October 2008. ^ "Dockville". Retrieved 19 June 2009. ^ "1. Mai-Demo in Hamburg: Was soll der Krawall auf der Schanze noch?". www.spiegel.de. Retrieved 9 February 2017. ^ "Raid of "Rote Flora" G8 Convergence Centre in Hamburg". www.indymedia.org.uk. Retrieved 9 February 2017. ^ "Raid of "Krawalle beim G20-Gipfel - Randalierer setzen Autos in Brand". www.spiegel.de. Retrieved 11 July 2017. ^ "Krawalle in Hamburg beim G20-Gipfel - Rote Flora distanziert sich von Gewaltausbrüchen". www.rp-online.de. Retrieved 11 July 2017. ^ "Website of the Anglo-German Club". Retrieved 15 December 2015. ^ "Britain in Hamburg". ning.com. Retrieved 13 September 2009. 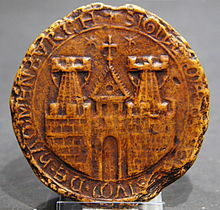 ^ "Anglo-Hanseatic Lodge 850". gl-bfg.com. Archived from the original on 28 April 2016. Retrieved 14 September 2015. ^ "Grand Lodge of British Freemasons in Germany". gl-bfg.com. Retrieved 14 September 2015. ^ "United Grand Lodges of Germany". freimaurer.org. Retrieved 14 September 2015. ^ "The Anglican Church of St Thomas Becket – A welcoming, active and inclusive church, growing in our relationship with God and the wider community". anglican-church-hamburg.de. ^ "Website of the American Club of Hamburg". Retrieved 13 September 2009. ^ "Website of the American Women's Club of Hamburg". Retrieved 13 April 2014. ^ Germany, AmCham. "American Chamber of Commerce in Germany". amcham.de. ^ Journals of Dorothy Wordsworth, Macmillan 1959. ^ "Arbeitnehmerverdienste in Hamburg 2016 - Statistikamt Nord". www.statistik-nord.de (in German). Retrieved 1 November 2017. ^ "Welcome to the Port of Hamburg". The official website of the Port of Hamburg. Retrieved 1 November 2017. ^ M. Ramesh: M. Ramesh (25 December 2000). "Making Hamburg Europe's preferred port". Hinduonnet.com. Archived from the original on 20 July 2009. Retrieved 11 August 2008. ^ "Tourismus in Hamburg 2017 [in German]" (PDF). Statistik informiert ... 21 February 2018. Retrieved 20 January 2019. ^ Rene S. Ebersole (November 2001). "The New Zoo". Audubon Magazine. National Audubon Society. Archived from the original on 6 September 2007. Retrieved 1 October 2008. 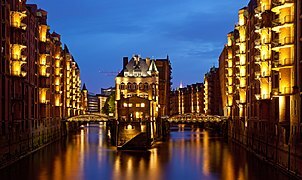 ^ a b c "Tourismus in Hamburg im Dezember und im gesamten Jahr 2016 - Statistikamt Nord". www.statistik-nord.de (in German). Retrieved 1 November 2017. ^ "Backbeat filming locations". movielocations.com. Retrieved 1 October 2008. ^ other prefixes used between 1945 and 1956 were "MGH" (Military Government, Hamburg: 1945 only), "HG" (1947 only) and "BH" (British Zone, Hamburg) between 1948 and 1956. ^ a b "Zahlen | HVV-Verbundbericht". www.hvv-verbundbericht.de. Retrieved 1 November 2017. ^ Tramway & Light Railway Atlas – Germany 1996. London: Light Rail Transit Association. 1995. p. 262. ISBN 0-948106-18-2. ^ "Zahlen | HVV-Verbundbericht". www.hvv-verbundbericht.de. Retrieved 1 November 2017. ^ "Hamburg Public Transportation Statistics". Global Public Transit Index by Moovit. Retrieved 19 June 2017. ^ "HTHC Hamburg Warriors". Hamburgwarriors.com. Retrieved 25 January 2010. ^ "Wie viele Schulen gibt es?". hamburg.de (in German). Retrieved 1 November 2017. ^ Hamburg, Hamburger Abendblatt -. "Hamburg hat so viele Studenten wie nie zuvor" (in German). Retrieved 1 November 2017. ^ "Dresden – Partner Cities". 2008 Landeshauptstadt Dresden. Archived from the original on 23 October 2007. Retrieved 29 December 2008. ^ Holtermann, Hannes (30 March 2011). "Looking at the sister city agreement between Hamburg and Dar es Salaam from a Tanzanian perspective". Werkstatt.imch.eu. Retrieved 29 July 2013. Chisholm, Hugh, ed. (1911). "Hamburg (city)" . Encyclopædia Britannica (11th ed.). Cambridge University Press.